For three weeks in June, I traveled up and then down the eastern seaboard visiting ecological research sites. From Florida to Maine and back again I toured urban forests, marshes, estuaries, and more, stopping along the way to visit family and friends. One particular resting place brought me to familiar birding territory: Pleasure House Point, Virginia Beach. When I was first learning to bird in the summer of 2013, I spent a summer living with my fiance in Virginia Beach. Every day I took my camera and binoculars and walked the entire length of the trail on Pleasure House Point, which borders a marsh near the Lynnhaven Inlet. It was here that I discovered my first White Ibis, my first Eastern Towhee, my first Blue-Gray Gnatcatcher, and while these species may be “common” to me now they filled me with wonder then. Unsurprisingly, I am very fond of this small piece of natural habitat. During my three days in Virginia Beach, I knew I had to walk that path again. Exploring the trail, keeping the dog safely on a leash. 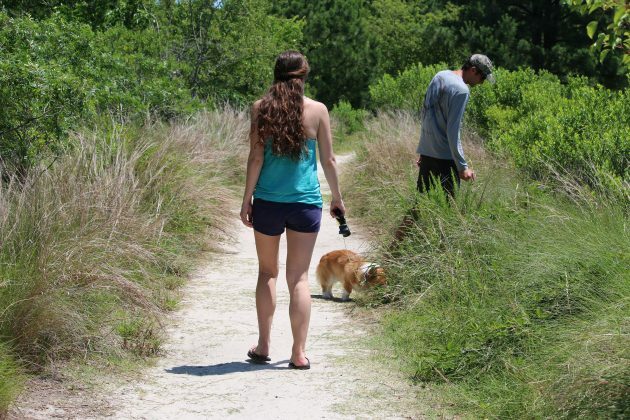 The tide was low when my now-husband, our friend, her corgi, and I hit the trail – a good sign for birding. Little seemed to have changed, other than a brand new LEED-certified environmental center that had been built near the terminus of the protected area. 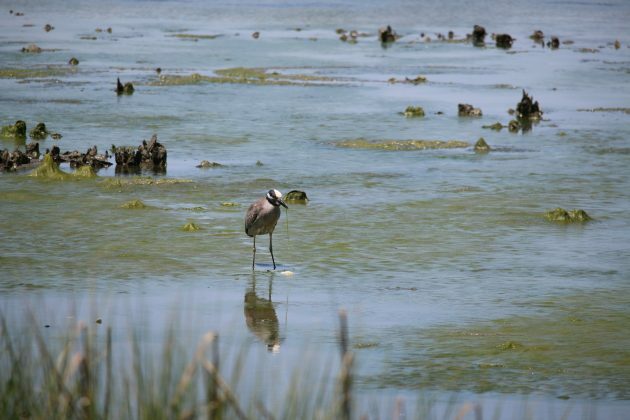 Yellow-crowned Night Herons were plentiful, roaming the flats for crustaceans and other prey. A Green Heron stood stock-still as we passed, blending in with the raised oyster beds recently exposed by the retreating tidal waters. Osprey and Royal Terns soared on the coastal winds overhead, and Red-winged Blackbirds sounded their raspy calls just about everywhere. A strong sense of nostalgia washed over me. It’s true, as I looked closely I noticed other differences. Marsh grasses had retreated from a section of trail bordering the water, a legacy of anglers wading there to try their luck with Redfish and other sport fish. More people were on the trail than I remembered, and one dog was off its leash (not ours!). Virginia Beach is pretty built up, so each disturbance and loss of habitat weighs on our avian friends. 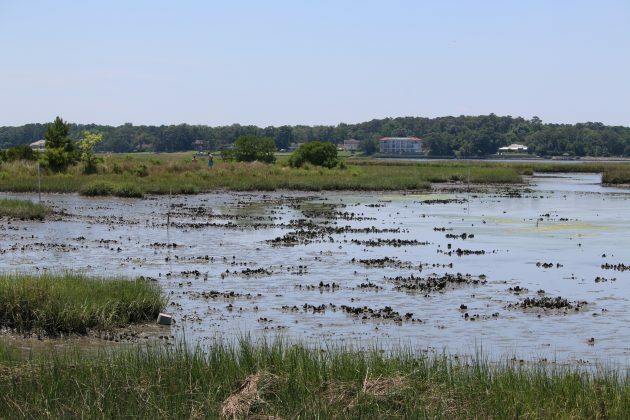 Still, if so many people use the trail along the marsh, they can all become potential advocates for its continued protection and for the conservation of ecosystems like it. As for me, I loved birding there just as much now as I did four years ago. My identification skills may have improved, but my love for birding remains the same!